During our weekly family meetings, we plan dinner for the week together and record it on our Family Meeting Planner. I encourage my kids to offer up different dinner suggestions rather than asking for the same meals every week. However, there are certain meals they’d be happy to have weekly. Like most families, tacos and pizza are popular choices in our house. 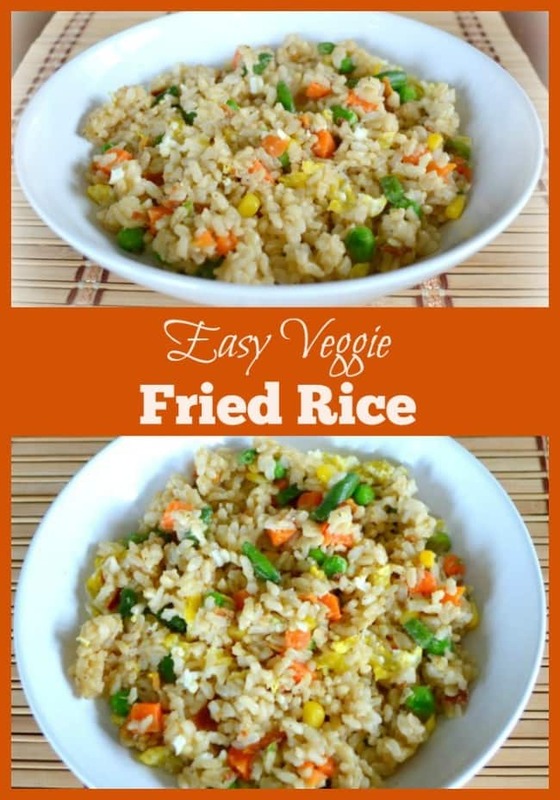 Another of my family’s favorite dinners is this super easy veggie fried rice. 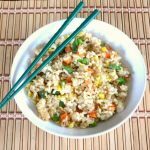 This easy veggie fried rice is also one of my favorites to prepare since I usually have all of the ingredients on hand. I also love that it’s chock full of whole grains and vegetables. If you add some egg and bacon for protein, it’s a well-balanced meal all in one bowl! Fried rice was not always a hit with my kids. Some of my early efforts were sticky, bland, or overly seasoned. I’ve learned some tricks over the years that have helped me perfect this dish. Make the rice ahead of time. This will keep your fried rice from being sticky. If I think of it, I make it the night before or in the morning. If you forget to make it in advance, you can salvage your dinner effort by refrigerating the rice as soon as it’s done cooking. My secret ingredient is yum yum sauce. After my kids kept raving about how perfect the fried rice at our local hibachi restaurant is, I realized the big difference between the restaurant rice and mine was that they used yum yum sauce in theirs. Since my kids like to use this like ketchup for our Asian dishes, I always have a bottle of it in my refrigerator. If you don’t keep this on hand, you can whip up your own with this recipe for homemade yum yum sauce. Add seasoning gradually. 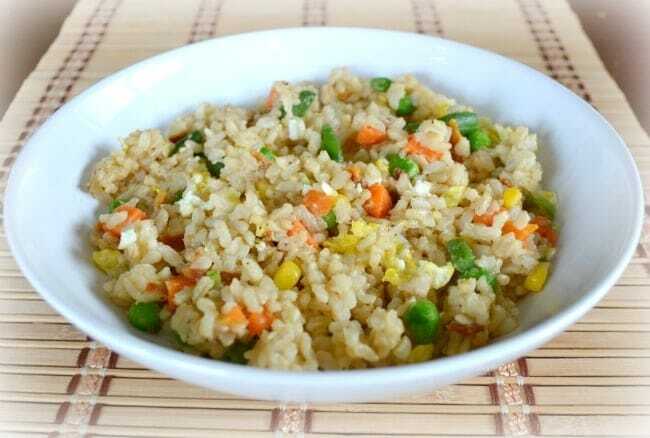 In my recipe, I recommend the amount of salt, pepper, and garlic powder to include but EVERY time I made fried rice, I end up using a little less or a little more to get the taste just right. You can always add more, but you can’t take some out if you’ve overseasoned. Heat wok over medium heat. Add sesame oil to wok. Sauté onion in sesame oil until translucent. Add vegetables and cook over medium heat for 3-4 minutes, stirring continuously. Add rice to wok and mix well. Cook until vegetables and rice are warmed through, stirring frequently to prevent rice from sticking to the wok. This looks delicious and so easy to make! Thank you.? 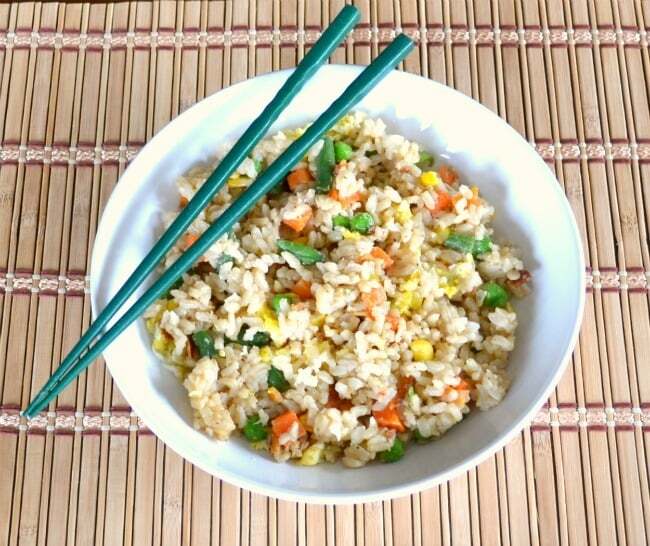 I know my family will love your fried rice recipe, too. it’ll be perfect for busy weekday nights. This looks delicious, healthy and really easy – just my kind of meal. I bet my kids would love it too. Thanks for sharing!